Usually additives used in hydroponics need to be added in rather large quantities to obtain palpable results. Molecules like salicylic acid - which we have discussed before - need to be used in concentrations in the order of 10-4 to 10-2 M to obtain a significant effect. This means that you need to use quantities in the order of 20-150ppm of most additives in order to see a significant result. However there is a molecule called 1-triacontanol that can generate very significant results with only a fraction of that concentration. Today we will talk about this substance, what it does, how to use it and why it's such a desirable tool in your hydroponic additive arsenal. Many of the things I will talk about in this article are derived from this 2011 review on triacontanol (make sure you read that for a deeper insight into why this molecule works). Triacontanol is a very long fatty alcohol. Each molecule has 30 carbon atoms linked in a linear structure which makes this molecule extremely hydrophobic and hence very hard to dissolve in something like water. Using triacontanol therefore involves dissolving this molecule in something other than water - for example Tween 20, chloroform, methanol - before adding water in order to prepare an emulsion for use in either root applications or foliar feeding. 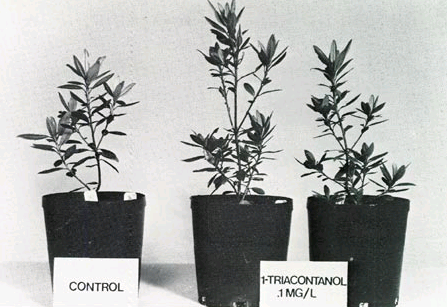 Most research using triacontanol has used foliar feeding as this is the easiest way to control the application of the molecule and also how it seems to have the largest effect. The effects of this molecule are not short of miraculous. Triacontanol is usually applied in concentrations on the order of 10-7 to 10-9 M, which means it is used from around 0.01 to 1 ppm. This means that we use about 1000 times less triacontanol than other additives in order to obtain a meaningful result. 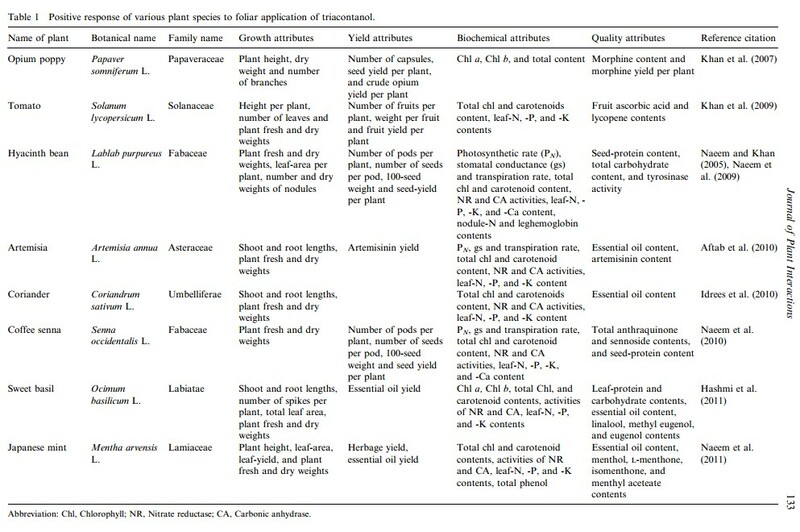 The table below shows some of the effects that triacontanol has showed in peer reviewed studies, with plant height, weight and yields increasing across a variety of different species, from tomatoes to japanese mint. Papers on other plants besides those on the chart have also been published, for example triacontanol has showed to significantly increase yields in lettuce crops (here). Some studies have also found that the effect of triacontanol can also be enhanced through the use of magnesium or in conjunction with other hormones (here). With such an impressive array of effects and such a low expected toxicity - due to its very low solubility - it's definitely one of the best additives to use to get production gains in hydroponic crops. This also makes it one of the most commonly used substances in commercially available grow enhancers. Nonetheless since it's used in such a small quantity it's very easy for someone to buy a small amount of triacontanol and use it for years before running out. You can buy small amounts of triacontanol as a powder (there are several reputable sellers on ebay) and you can then prepare your own concentrated triacontanol solution in Tween 20 - not water - that will last you for ages. A liter of 2000ppm solution of triacontanol will last you for 1000-2000 liters of foliar spray. You cannot get more economical than that. The optimum application rate and frequency for triacontanol varies across different species but if you want to take an initial guess use a foliar application of a 0.5 ppm solution every week. There is usually a sweet spot for concentration - after that you start to see a decrease in results compared to the highest point - so you want to start below a 1 ppm application rate. For some crops repeated applications might be unnecessary - with just one or two applications giving most of the effect through the entire crop cycle - while for others you do want to apply every week. How you initially dissolve the triacontanol to make your concentrated solution is also important with Tween 20 being the most ecologically friendly - although not the easiest - option. I know many commercial nutrients contain some amount of triacontanol; heavy fire, cannaboost, etc. But as far as I can see, they never list the actual ppm achieved using their products... is that information available anywhere? This information is not publicly available anywhere - they do not need to disclose it due to the low toxicity and very low concentration of triacontanol present - but the actual active concentrations of triacontanol needed are very small. The article suggests some concentrations of triacontanol that are commonly used in research and commercial applications, if you go with those you will certainly see some effects. I read some articles where they claim that Polysorbate 20 is not ok for triacontanol .In your text you say make your concetrated silution with him.In your book is detal explanation of making stock solution in Polysorbate 20? Do you have in your book instructions how to make triacontanol in stock solution with Polysorbate 20 , not water, after dissloving?